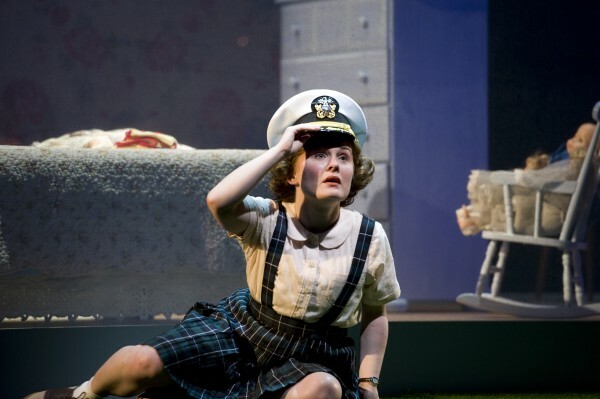 Emerson in the role of Young Amelia in Seattle Opera’s production of “Amelia” in May 2010. 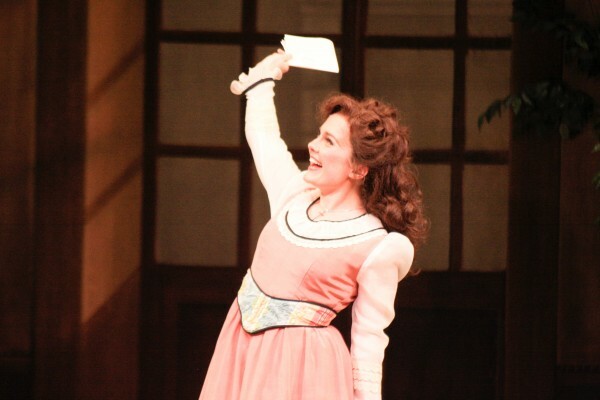 Emerson in the role of Rosina in “Le Nozze de Figaro” at Opera Grand Rapids in Michigan in April 2011. Ashley Emerson will perform the role of Marie in “La Fille du Regiment” with PORTopera this Thursday and Saturday in Portland. In between rehearsals, Ashley Emerson flops down on a couch in the greenroom at Portland Stage, relaxing for few moments. Opera is serious business, and when the up-and-coming soprano isn’t inhabiting whatever character she’s playing and reaching for that gloriously high note, she’s warm, friendly and casual. She’s a Bangor girl, after all — she’s supposed to be down-to-earth. Emerson will perform the lead role of Marie in Donizetti’s comic opera “La Fille du Regiment” in PORTopera’s production, set for 7:30 p.m. July 28 and 30 at Merrill Auditorium in Portland. After that, it’s back to New York, where she’ll be involved in a number of different productions with the Metropolitan Opera, culminating with her performance in a brand-new opera, “The Enchanted Island,” a baroque pastiche of Shakespeare’s “The Tempest” and “A Midsummer Night’s Dream” with arias by Handel, Vivaldi and Leclair, set to debut in December. She’ll share a stage with the legendary Placido Domingo, and she’ll understudy the role of Miranda, one of the leads. Nine years ago, Emerson was a junior at Bangor High School when her music teacher, George Redman, suggested she give opera a shot, just to see if she’d like it. She was already an old hand at musical theatre and dance and was a born performer. Redman had heard a lot of opera voices throughout his career, and early on in Emerson’s high school career, Redman knew she had the kind of voice that could take her far. A lesson with Bangor-area vocal coach Ann Mills was enjoyable for the young singer, and almost immediately she could hear the difference in her performance quality. Emerson attended the University of Southern Maine and majored in vocal performance, where she excelled in both musical theatre and opera and regularly performed with the chorus of PORTopera. In 2006, she signed up for the prestigious Palm Beach Opera competition in Florida, and to her shock, she won the junior division. That led to her being asked to audition for the Lindemann Young Artist Development Program at the Metropolitan Opera — one of the best programs in the world for training young opera singers. She was one of eleven young singers accepted that year into the three-year program. By the end of 2009, Emerson had already performed as Papagena in The Met’s production of Mozart’s “The Magic Flute,” and had performed the small role of Barbarina in “Le Nozze de Figaro,” in which New York Times opera critic Steve Smith said she “sparkled.” This spring, Opera News Magazine ran a feature on Emerson and her upcoming roles. Emerson’s star steadily been rising. In May 2010, she performed the role of Young Amelia in the Seattle Opera’s world premiere of Gardner McFall and Steven Wadsworth’s opera “Amelia,” about a young woman’s 30-year journey of healing and renewal beginning in the Vietnam era and extending to the mid-1990s. She took on the role of Flora in Benjamin Britten’s “The Turn of the Screw” with the Los Angeles Opera in March of this year and performed the lead role of Rosina in “Le Nozze de Figaro” with Opera Grand Rapids in Michigan in April. She has already sung the role of Marie in “La Fille du Regiment,” with the Opera Theatre of St. Louis in May and June, so she’s plenty warmed up for her debut with PORTopera this weekend. Emerson has cultivated a style and technique that means she is suited for specific roles within the opera repertoire, both classical and contemporary. As a lyric coloratura soprano, roles like Marie, Rosina, Cunegonde in Bernstein’s “Candide,” Adele in Strauss’ “Die Fledermaus” and Gilda in Verdi’s “Rigoletto” are suited to Emerson’s style — bright, light and agile, complimenting her petite, youthful appearance. In 2012, she’ll perform roles including Violet in “The Golden Ticket,” an operatic version of Roald Dahl’s “Charlie and the Chocolate Factory” produced by Atlanta Opera, and Blonde in Mozart’s “The Abduction from the Seraglio” with Pittsburgh Opera. In June, she’ll return to Opera Theatre of St. Louis to take on the role of Alice in Unsuk Chin and David Henry Hwang’s American premiere of their “Alice in Wonderland” opera — another youthful, lyrical role. Emerson’s career is already zipping along at great speed, and few would be surprised to see her go onto even bigger and better things in the next few years. Though she is based in New York and often lives out of a suitcase when she’s on tour, she still considers Maine home. It’s where she got her start, after all. Redman, understandably proud of his protege, attributes her success to a number of elements — a little bit of luck but mostly talent and hard work. Tickets for “La Fille du Regiment” start at $41 and are available online at portopera.org; performances are set for 7:30 p.m. Thursday, July 28, and Saturday, July 30, at Merrill Auditorium in Portland. For more information on Ashley Emerson, visit ashleyemerson.net.